Last Sunday evening, the pass of the Terra SAR X and Tandem X close duo posted earlier here and a pass of Lacrosse 4 shortly after that, were not the only observations I made. Somewhat later that night, I targetted several geostationary satellites, using both the Canon EF 2.5/50 mm Macro lens and the Carl Zeiss Jena Sonnar MC 2.8/180 mm lens (the latter for the first time on geostationary objects). 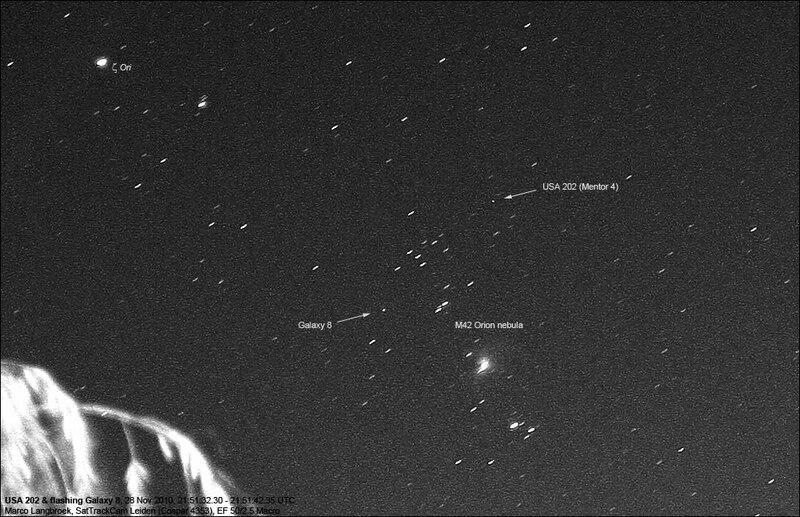 The image above, taken with the EF 2.5/50mm lens, shows two geostationary objects close to the Orion nebula. One is the classified object USA 202/Mentor 4 (2009-001A), a big SIGINT geostationary satellite with a brightness of about mag. +8. It has featured on this observing blog earlier. The other one, Galaxy 8 (1997-078A), is a commercial communications satellite and was captured serendipitously in the same image while it was brightly but briefly flashing. It is not visible in an image taken 30 seconds later (and only faintly visible in an image taken 3.5 minutes earlier). 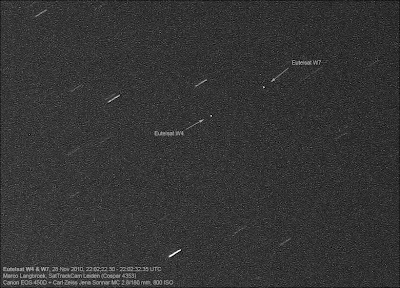 I also imaged the mysterious classified geostationary PAN (2009-047A) for the first time, using the new Carl Zeiss Jena Sonnar MC 2.8/180 mm lens. 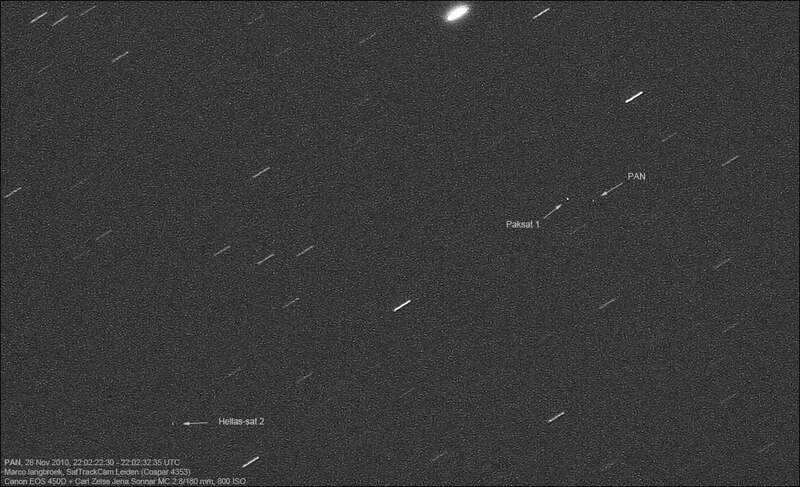 Below image shows it together with the nearby commercial geostationary satellites Paksat 1 (1996-006A) and Hellas-sat 2 (2003-020A). PAN is a very mysterious object, the mysteries surrounding the 2009 launch being discussed at length by Dwayne Day in his Space Review article here. The mystery was (and is), that no Agency (neither NRO, USAF, US Navy nor CIA) claimed responsibility for the launch. Owner and role are hence unknown. There was much speculation about the possible role of the spacecraft, and the meaning of the acronym PAN. 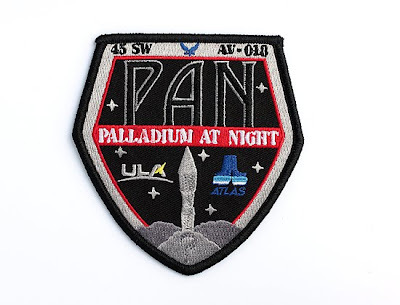 The latter got at least one "solution" when the launch patch (below) appeared, suggesting PAN stood for "Palladium At Night". Whatever that may mean. 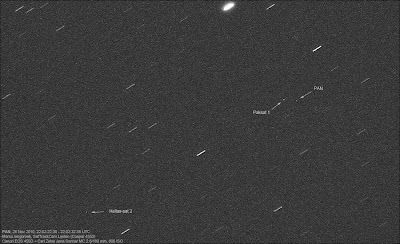 The same images that contained PAN, Paksat and Hellas-sat 2 also contained the very faint trail of a Breeze-M tank (2009-050C) and two more geostationary satellites: Eutelsat W4 and Eutelsat W7 (2000-028A and 2009-065A). This all in an image only a few degrees wide! Last but not least, the classified geostationary communicatiosn satellite Milstar 5 (2002-001A) was imaged. 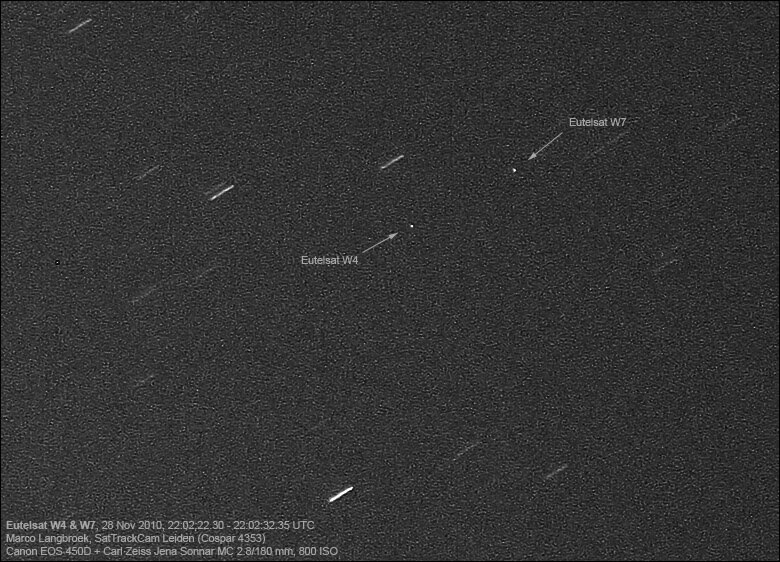 In the same image(s), two other, commercial geostationary satellites were visible: Galaxy 11 (1999-071A) and Inmarsat 4-F2 (2005-044A). A rich haul of geostationary objects, obtained at mildly frosty temperatures of -2.5 C!